The only retina display Macs(s aapl) you can get these days are MacBook Pro laptops. That’s because they’re the only Apple devices that support both high-resolution displays and the software scaling needed to keep text and icons both big and clear. It looks like that’s about to change thanks to OS X Mavericks 10.9.3 and 4k monitors. 9to5 Mac notes that the 10.9.3 beta includes support for retina display scaling on 4k monitors — those with resolutions from 3840 x 2160 or higher. 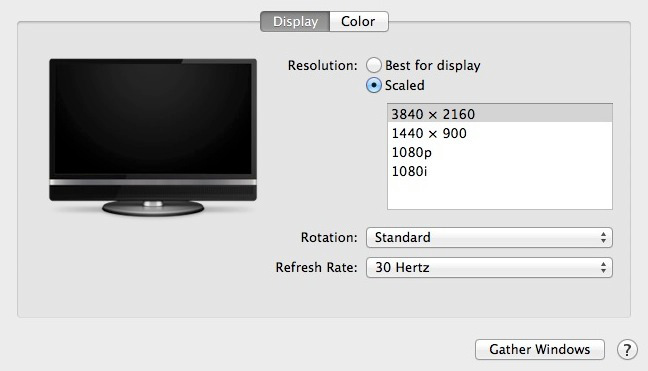 Anyone using the beta software will see the new scaled option in the OS X display settings, which will effectively double the pixels for on-screen elements. Without scaling enabled, OS X uses a 1 to 1 method to display everything, meaning icons, text and controls are all very small on a high-resolution display. Apple doesn’t yet have a 4k monitor of its own to sell, but does offer a Sharp 4k display for $3,595 in the Apple Store. The monitor complements the new Mac Pro, which is capable of driving three independent 4k monitors simultaneously. For now, however, those would be showing unscaled, small content. If the scaling feature makes it to the final version of OS X Mavericks 10.9.3, the content would then be larger and clearer to see. I am just wondering when they gonna take their prices down so a person like me can also buy their retina laptops. Anyways. OH good, things we really can’t use right now. How about fixing WiFi in the MBP?!!!!!!!!!! !